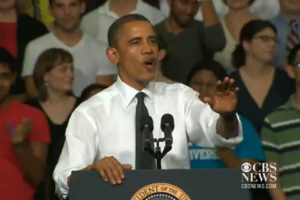 During a at rally Ohio State University on Thursday, a heckler interrupted President Obama‘s speech about energy. Pausing, Obama directly addressed the man, asking him not to interrupt. “You’re being rude,” he said. Now I can read some of y'all mind and I know you are saying, "I wish he would check some of these Republicans the way he checked that heckler." I understand. I was thinking the same thing. The admonishment comes at the 1:01 mark.